Farmingdale State College recently hosted the 32nd Annual Long Island Water Conference (LIWC) Best Tasting Water Contest, and the Franklin Square Water District (FSWD) took top honors as the best tasting tap water in Nassau County. 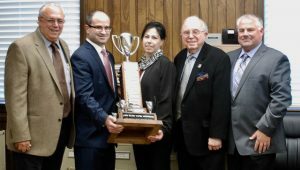 Photo: Left to right: Commissioner Ralph Pugliese, Assemblyman Edward P. Ra, Commissioner Madeline Presta, Commissioner Salvatore A. Intagliata, District Superintendent John Hughes. 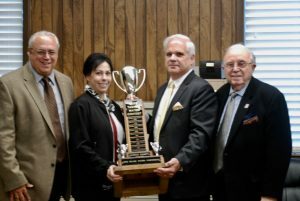 Photo: Left to right: Commissioner Ralph Pugliese, Commissioner Madeline Presta, Dennis Kelleher H2M, Commissioner Salvatore A. Intagliata. Edward P. Ra, Assemblyman of the 19th District, also attended the informal ceremony at The Franklin Square Water District. Each year during National Drinking Water Week, the LIWC invites Long Island residents to sample tap water from Nassau and Suffolk water suppliers in a blind taste test. Franklin Square received the most votes from the hundreds of contest participants. In addition, water experts were at the event to educate the public regarding the source(s) of their water and the invaluable importance of water quality, conservation and sustainability. The Franklin Square Water District has delivered an uninterrupted supply of the highest quality water to residents since 1923, meeting or exceeding all New York State and Federal regulations, as well as industry standards.